> What is Daughter of the Sword about? Honestly, Publisher's Weekly did a much better job of summing this up than I can. Is it a cop-out if I just give you what they said? > Do you have plans to write other Fated Blades novels or stories, in addition to the eSpecial, Only a Shadow? Last month I turned in the manuscript for book two, Year of the Demon, and right now I'm working on plotting book three. This afternoon an idea jumped into my head about another possible eSpecial. I'll have to toy around with that one for a while before I can say whether it's got legs. > You've lived in Japan, studied 25 martial arts and are currently teaching Asian philosophy and history. Did you need to do any research for this novel, and if so, how much? Yes, heaps! It's true that I know a lot about Japan, but no one can know everything, and of course when you're writing you can never predict exactly which details you'll need. The experience I've gathered serves very nicely as a background for the story, and sometimes little details pop out of the background that are just right for the scene, but most of the time I'm inserting footnotes to myself as I write, so that when I've got a finished draft I can go back and hunt down all the details I need. > You have travelled to numerous places to study, work and vacation including Germany, Japan, Hawai'i, Antarctica, the Mediterranean and Africa. Which place did you like the most and why? I love wildlife photography, so the top two would be the Antarctic Peninsula and Kruger National Park in South Africa. Very different animals, of course, and fascinating for very different reasons. I had a bull elephant aggress me in little my rental car in Kruger, and I had penguins stand on me in Antarctica. Not everyone's idea of a vacation, I guess, but those were two of the greatest thrills of my life. I don't know that I ever wanted to be a writer. I am a writer inasmuch as I write stories, and in that sense I've been a writer for as long as I can remember. If the question is, what made you want to be a published author, I guess I got prodded into it. A friend read one of my stories and said I ought to submit it to Writers of the Future. I wasn't sure my stuff was good enough, but on his recommendation I bought the most recent edition, and I felt like half of the stories in there were a lot better than I could write, and the other half weren't as good as what I could write. I guess the judges agreed, because in the next year's edition I got second place. > Who is you favourite character in your book and why? Okuma Daigoro. 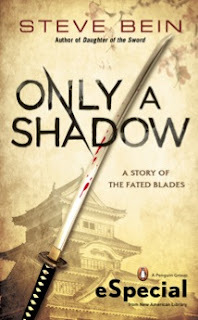 He's a boy on the verge of manhood in a samurai clan, struggling to live up to his father and his brother. 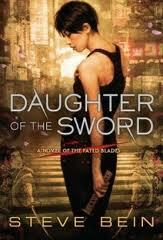 In Daughter of the Sword he's the character who struggles the hardest to live up to the bushido code. It's impossible -- no one could ever become the perfect embodiment of the samurai ideal -- and yet he just doesn't know how to give up. I love making his life worse and worse, and watching him struggle and refuse to quit. Yeesh, I don't think so! The reason they're interesting is that I make their lives difficult. Mariko curling up with a book on a quiet afternoon is a lot less interesting than Mariko's family life going to hell while her boss tries to sabotage her career and a yakuza enforcer tries to kill her. Thanks but no thanks. I'll stick with a nice quiet afternoon and a good book. 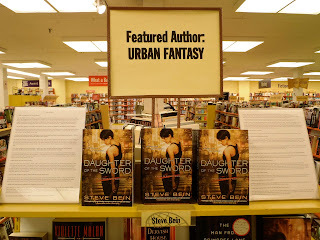 > What were your literary influences for Daughter of the Sword? 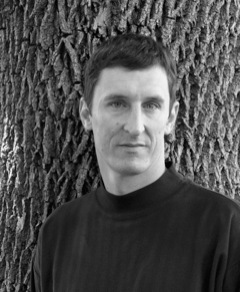 China Mieville for making setting come alive. James Clavell for making Asian cultures real for Western readers. J.R.R. Tolkien and Frank Herbert for world-building. Neal Stephenson and William Gibson for unabashed Japanophilia. Kurosawa isn't literary, but he's a huge influence for me, both for telling samurai stories on an epic scale and for giving me permission to let a story unfold at its own pace. Novels. I'd love it if the ideas that pop up in my head were short and sweet, easy to encapsulate in five or six thousand words, but they're not. Most of the stories I want to tell are more complex than that. Daughter of the Sword is a case in point: it's four storylines woven together, and even each of those is too long to be a proper short story. Daughter of the Sword is the first published novel, and it's been in the works since 2003. But that's misleading: it's not as if I was sitting with a pen in hand agonizing over this book for nine years. I got my PhD in the interim, and finished a couple of academic books, and moved across the country four or five times. Plus, when you're an aspiring novelist and not yet a novelist, you can polish and revise endlessly. Year of the Demon is a better example. It's the first book I wrote under a deadline, and it took me fifteen months to write, soup to nuts. I have a notebook with me almost everywhere I go, but I'm most productive at home after everyone else goes to sleep. For me the worst is not being able to see where I need to go. I can only write well after I have a clear outline all mapped out, and it is enormously frustrating to have a vision of where I need to go but have no map for how to get there. I've had a sci fi novel set in Antarctica percolating in my head for four years because I just can't see where I need to go. It can be really painful. And the best thing? It's hard to say. When the writing is going well, time just disappears. I like that. It's meditative. And I enjoy going through the editing process and discovering a passage that's really well written. I'm so critical in editing, so it's really nice to find passages where I have to salute myself for a job well done. How much time have you got? I was pretty naive going in. I guess one of the most surprising lessons was that editors are nice people. They sure don't feel like that when you're on the outside getting shot down. This is going to sound completely banal, but the best advice I can offer is don't give up. Daughter of the Sword collected rejection after rejection, year after year, including twice by the same agency that now represents me. To tell the truth, I did give up once. I tried every trick in the book to get an agent and none of them worked, so I said screw it and stopped submitting the manuscript. Luckily for me, my memory isn't so great, and six months later I forgot that I'd given up. The next agent I submitted to picked me up. A few months later she got me a two book deal with Penguin. Have lots of writing projects going at once. Make a list of what you've got to do, and tackle the easiest thing on the list. That way you always feel like you're getting away with something, and yet you're always making forward progress. Sometimes the only thing to do is turn off the phone, cut off your internet access, and sit in front of the keyboard for an hour no matter what. Sooner or later you get bored and you have to write. This was a bit of a curse, actually. My first short story was accepted on its first submission. That put the idea in my head that you're supposed to get accepted when you submit. Not so. I've collected my dozens of rejection letters since then, but stepping into the learning curve at the wrong spot can be really depressing.